I couldn't sleep last night 'cause I had a coffee. Probably I will never learn.. Caffeine is bad for sleep. I slept just 3 hours. I was already packed. I will check out from my room and we'll keep the other one for shower, stuff and maybe afternoon nap. Knocking on the lover birds door... Knocking again... "Are you f**cking kidding me? You two better be ready to leave or I am about to break the door." I was freaking out. Of course, they just woke up. At least, they were quick. We have booked tuk tuk for 5:30am in front of our hotel. It was a fresh morning, still dark and we were all sleepy..
Angkor Wat in front of us and thousands people sitting, standing and walking around the lake. "I told ya it's gonna be like this" - Jon said. This was his 3rd time here. In a few minutes sun was up and we decided to stay a bit longer near the lake enjoying our coffee and breakfast. 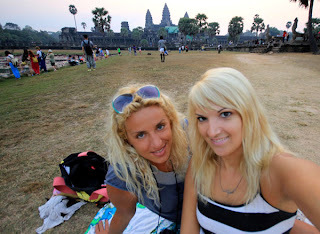 Picnic at Angkor Wat :) Anyway, we have the whole day. After half an hour we finally moved. That was really hard decision cause we almost fall asleep. Maria was "crying" all the time that she wants to sleep and Jon as well. I was really excited about this, and I felt pretty good. 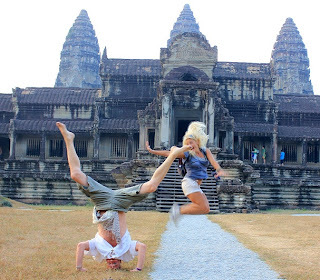 Angkor Wat temple is amazing. The architecture is so unique and I loved all wall crafts and details. The temple was built in 12th century by king Suryavarman the second and it is a biggest Hindu complex and religious monument in the globe. In the beginning it was Hindu (dedicated to God Vishnu) then Buddhist (late 13th century). 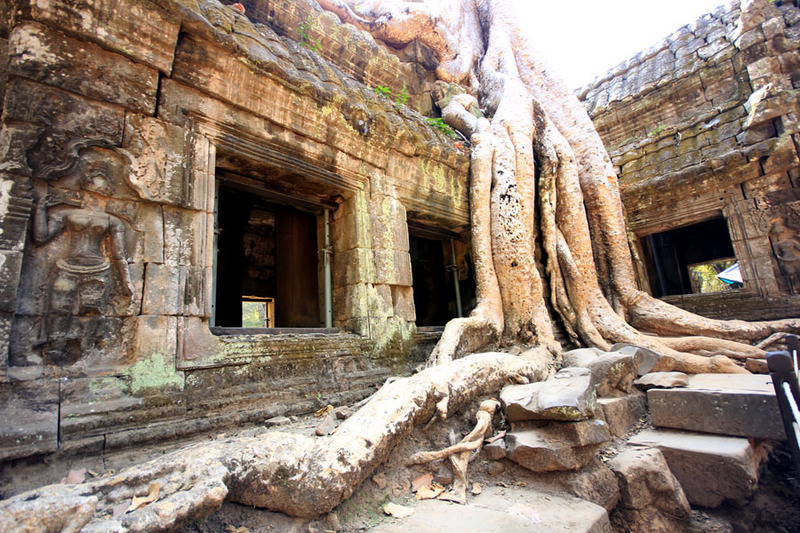 The temple is part of the Angkor World Heritage Site, established in 1992. After one hour or so, we went to see another temple. 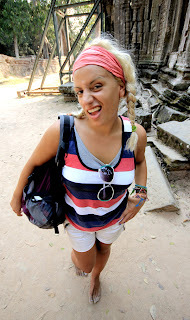 It was my favorite and and perhaps one of the most picturesque - Ta Prohm temple, nicknamed "Tomb Raider temple". Jon decided to stay in tuk tuk and to try to catch some sleep. 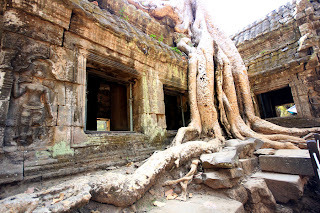 The temple was built in late 12th century by king Jayavarman VII. It was Buddhist monastery and university. 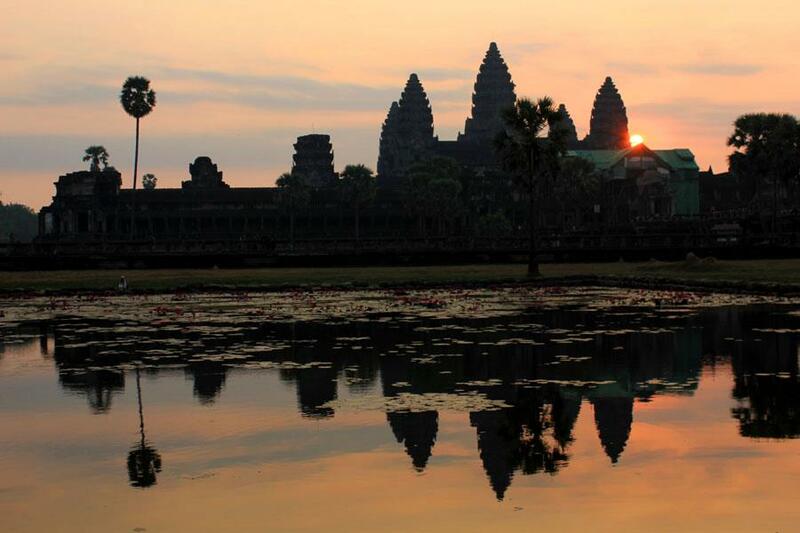 It is one of the most visited complexes in Cambodia’s Angkor region. We had lucky, it wasn't that busy so we could walk and make photos without being in rush. When we got back to the parking Jon wasn't in a tuk tuk. We saw him near some souvenir shop. He said he couldn't sleep. We took a seat in a shadow just to relax and refresh with some cold drinks. It was really hot. 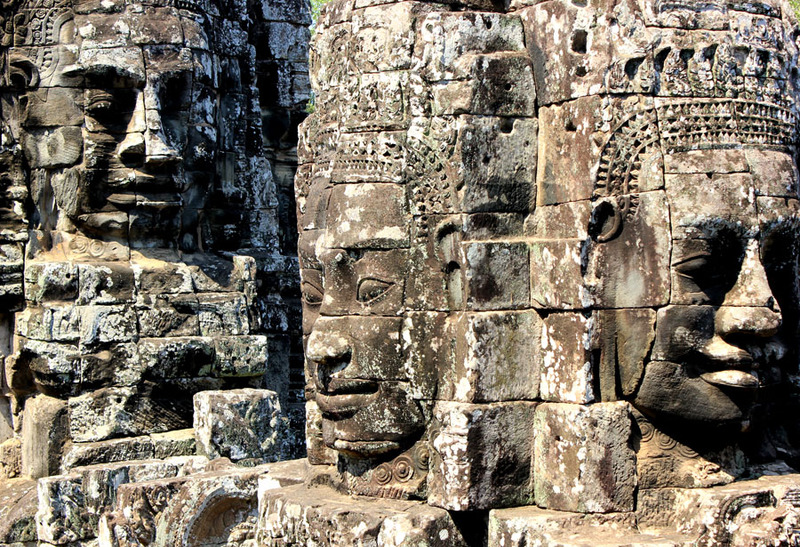 The last temple on our "must" list was Bayon. 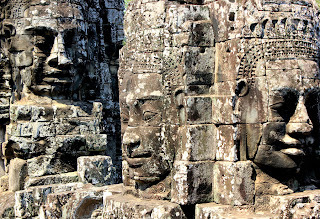 Built in late 12th century as well by the king Jayavarman VII as his official state temple and the last state temple built at Angkor. 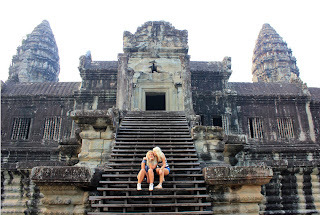 It is also richly decorated Khmer temple with massive stone faces on the many towers. Later we saw few smaller temples, not so important so I will not write about it. We got back to room in the late afternoon. Jon and Maria wanted to sleep so I gave them an extra hour and I went for a walk to the downtown. My boyfriend Canon decided to join me.